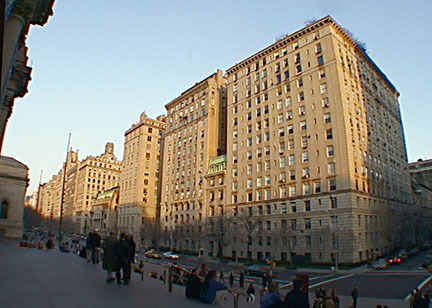 This distinguished, 15-story cooperative building is directly across from the entrance to the Metropolitan Museum of Art and was designed and erected in 1928 by famed developer Frederick Fillmore French, who would later build his own ornate office tower, the Fred F. French Building, at 551 Fifth Avenue, and the huge residential complexes of Tudor City and Knickerbocker Village, among other projects. In the early 1920's, penthouses were rare and not in vogue, but French built 1140 Fifth Avenue with a triplex penthouse for himself in 1922. A couple of years later, Condé Nast, the publisher, had the top of a new building at 1040 Park Avenue converted into a large penthouse that received wide publicity for his lavish parties and established penthouses as the ne plus ultra of apartment living. "From both door and windows one may gaze upon a suburban scene, grass lawns, shrubs, trees, and a sprinkling of butterflies...At one end, the lion of the fountain looks benignly down upon a toy flotilla in the pool beneath. Here, far above the policeman's whistle, three little boys find a variety of outdoor games. Tired of shipping, they engage in fortress in the sandbox, with now and then a race up the awning strings with caterpillars....As the season changes and the snow flies, all hands are out with shovels and the hot water hose to make a clearing. Traffic relieved, attention is soon diverted to a snowman. But most welcome of all are the first days of spring. Every size and weight of garden tool is then employed as 'Dad' and his gang of youthful workmen mix soil with sand and fertilizer. What a joyful mixing performance it is! The earth is then distributed and each, standing in front of his own particular forcing box, sows his favorite seeds. A few weeks later the green young shoots are carefully removed from the boxes and planted in their permanent beds in the garden, just as it is done by the 'best families' down on the earth. A complete roof, it seems, should never be without a handball court. Here the tired business man, in his walled arena, is 'fattened for the slaughter' of the next business day. Here, before dinner, he gyrates with his trainer, getting up the all-essential 'good old sweat.' Mark you, however, he is a martyr, not a handball player, for play must ever be cloaked in the dignity of the preparation for work." Ah, the delights of urban living! Naturally, New York living is never simple, and Alpern recounts a prolonged dispute many years later over the penthouse garden, which reportedly required an extra 40 tons of structural steel to support its 135 tons of soil and greenery. The penthouse was initially protected from the elements by a 12-foot-high steel-and-glass windscreen that was taken down, according to Alpern, in the 1940's, but restored to half its former height in 1988. French himself died in 1936. The building, which has 76 apartments, was converted to a cooperative in 1979 and two years later the board of directors insisted on removing the planting because of problems in two apartments below. The penthouse garden was then restored, but the problems reappeared and were followed by lawsuits, Alpern continued, with engineers providing conflicting testimony and with the board of directors charging that the garden was not original. Research by architectural historian Christopher Gray, however, Alpern observed, showed that the garden was original with the building and a court ordered the board to make the repairs at its own expense and restore the planted areas. 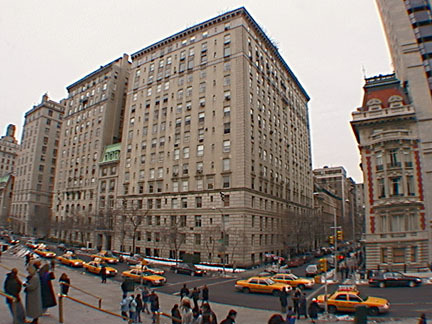 Other such disputes have occurred with other lovers of horticulture such as Stewart Mott who left one penthouse on Park Avenue to design the top four floors of the Galleria on East 57th Street (see The City Review article) with very extensive landscaping only to move to another penthouse on Fifth Avenue. With its handsome Italian Renaissance-style detailing, sidewalk landscaping and attractive sidestreet entrance, 1010 Fifth Avenue is one of the classic elegant addresses in the city. It has great views, a very impressive sidestreet entrance, a doorman, a concierge, sidewalk landscaping, but no garage, no health club and no balconies.